Following on from the most successful event of 2015, the independent transport videos cameras were invited back to record the Ribble Vehicle Preservation Trust’s third Lytham Hall Running Day. The event took place on Monday 29th August 2016 and was centred at the magnificent Georgian Grade 1 listed Lytham Hall and its beautiful grounds, offering a superb backdrop to the fine vehicles owned by the Trust as well as some visiting vehicles. Even the weather could not have been better, a warm and sunny day complete with blue skies! Our filming begins early in the morning at the RVPT’s Freckleton depot as we see the run out into service of the participating vehicles. These range from the beautifully restored Leyland Lion LT2 of 1931 through to the Leyland Olympians of the 1980s. Our cameras now board 2057 (RN 6822) a Leyland Titan TD5 dating from 1939, with an Alexander L53R body that dates from 1949 for the journey to Lytham Hall. We get both the passenger and driver’s views as we motor along the deserted roads and streets to our destination. On the arrival at the Hall we see the buses and coaches taking up their positions. 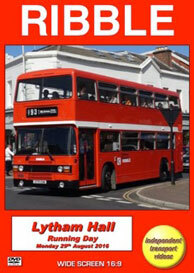 As well as the Ribble vehicles we have a representative from the erstwhile Lytham St Annes Corporation fleet. Number 24 (TJ 6760) is a 1934 Leyland Lion formally a Leyland demonstrator, looking resplendent in the royal blue of that undertaking. A ten-minute service was operated from the Hall to St Annes, via Lytham town centre and Fairhaven Lake. This ensured that preserved vehicles were in sight for most of the day in both towns and along the sea front. It also made interesting comparisons with the contemporary Enviro400 double deckers from Ribble’s successor, Stagecoach and the new ‘Palladium’ liveried Plaxton Centro bodied Volvos of Blackpool Transport! We now take a ride on Ribble 452 (FCK 884) a Leyland Tiger Cub with Saunders Roe B44F bodywork to Lytham town centre to capture the action in Clifton Street and along Central Beach. Our next ride is onboard 2101 (GFR 101W) an ECW bodied Leyland Olympian to St Annes Square. This is a very busy location with preserved buses seen from all angles as well as modern Stagecoach and Blackpool Transport vehicles. We even see a former Blackpool Corporation Leyland Atlantean in service with ‘Catch 22 Buses’ on their route 21. We return to Lytham Hall on former Blackpool Corporation 512 (HFR 512E) a 1967 Leyland Titan PD3A with MCW bodywork. From the Hall we board former Ribble 1995 (OCK 995K) a Bristol VRTSL6G, which was converted to open top when it was operated by Eastern Counties. Now preserved in it’s former livery of Eastern Counties, this VRT is owned by Neil Halliday and is operated by the Keighley Bus Museum Trust. We ride on it to Fairhaven Lake and record the action at this location. When 1995 returns from St Annes we board again for our ride back to the Hall to join our final ride of the day. This is on 338 (NCK 338J), a Bristol RESL6L with ECW B47F bodywork for a ride back to Lytham town centre to catch the late afternoon action. Final footage is shot along the lovely long driveway leading to the Hall, offering a super backdrop for these fine vehicles. We say farewell to the vehicles as they are parked up back at their Freckleton base and say thank you to the Ribble Preservation Trust for providing an excellent event, which we hope you will enjoy on this programme.